The last Open Fight Night of 2012 continued some interesting storylines of 2012 that seem all but assured to drip over into 2013. With AJ Styles nowhere to be seen and the relationship of Brooke Hogan and Bully Ray still under the microscope, these angles will definitely continue into the New Year. With the Aces and Eights still running rampant and Sting’s return next week, TNA looks to continue to build momentum. 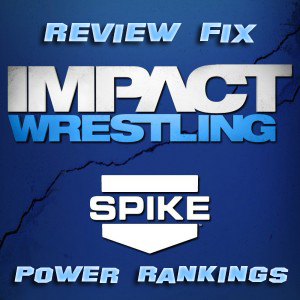 Here’s our list of who shined the most during the final week of Impact Wrestling. 5: Rob Terry: Sure, he’s still green as hell, but his “Bro-Off” victory over Robbie E and Jessie Godderz got him a nice applause from the crowd. Is the bulky Brit about to embark on his own journey for 2013? 4: Christopher Daniels/Kazarian: Sure, they got thrown around by the Tag Team champions on the last Open Fight Night of 2012, but they are still the most entertaining dup in the company. If only Hernandez and Chavo Guerrero could work the microphone, then maybe we’d care a bit more about TNA’s Tag Team division. 3: Rob Van Dam: A convincing win over the solid Christian York continues to make the TNA X-Division title one of the most interesting belts in wrestling today. That has everything to do with the work ethic of RVD. Since he captured the title, every week has felt like Open Fight Night. 2: Bobby Roode: Not the best end to his 2012, but he’s still a premiere heel in a company in need of them. His match with Austin Aries was solid as well, proving once again he’s grown into own of the best workers in the company. 1: Austin Aries: He’s lost steam since his loss to Jeff Hardy, but like Roode, he’s become a worthy main eventer. His next match with Hardy will definitely be another classic.